The comfortable house leaves nothing to be desired. It has on the ground floor an open kitchen with dining-living room and a toilet. On the first floor there are three bedrooms all with balcony. One with two single beds, one with a double bed (mattress 160 cm) and one with a double bed (extra long) with two mattresses and a spacious shower with toilet, bidet and sink. Outside there are two seats with table, chairs and loungers provided. The house is surrounded on three sides by flowers and trees. Thanks to the large windows and balconies all the rooms offer a fantastic view of the village, the sea, the Aeolian Islands, Vulcano, Lipari and Salina as well as the mountains. In good visibility you can even see the volcano Stromboli. The rooms are comfortable and tastefully furnished. Parking, stone barbecue, garden, outdoor shower, satellite TV, WI-FI, air conditioning, central heating, washing machine, bed, kitchen and Duschtuecher are available. Approximately 1300 m distance to the beach and village. Excursions: S. Giorgio is a suitable starting point for many excursions. 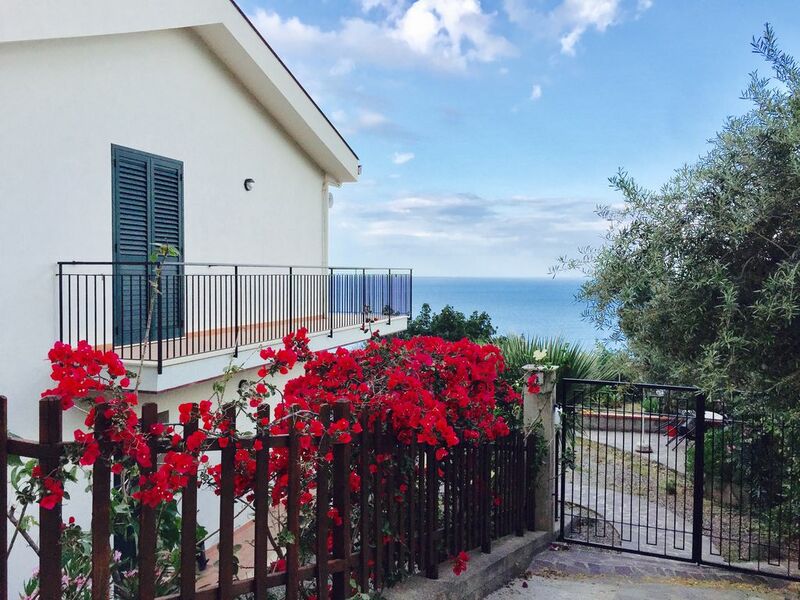 Tindari, via Patti direction Messina, church and antique theater with fantastic panoramic views. Down in the sea, in Oliveri worth a walk through the Laghetti, (Lagunenseen or Mare secco) which are under protection. Patti, old town and Villa Romana in Patti-Marina. Aeolian Islands, departure from Milazzo daily by hydrofoil or boat, in season also from Patti-Marina, Vulcano, the island with hot sulfur springs and a volcanic cone (crater ascent). Lipari, town with numerous sights. Cefalù, highway towards Palermo, intact Medieval town with harbor and Norman dome, temple ruins on the rock above the town. Nearby the mountain town of Castelbuono with its defiant castle. The volcano Aetna with its unique surroundings. Taormina with antique theater, palaces and churches in dream location. Fascinating Sicily: Sicily is the largest island in the Mediterranean and lies in its center. The geographical location, the mild climate and the fertile soil made Sicily a sought-after destination for many peoples. The result is an infinitely varied cultural heritage. Great witnesses of rich history meet you at every turn. The landscapes are full of surprises. The highest point is the volcano Aetna with its 3'300 meters. Wide beaches, lovely coastal areas alternate with rugged rocks. In the spring the hills show a lavish flower splendor. After the dry summer a second flower is created. Until the end of October, the 20 degrees warm sea invites you to swim. This diversity, the excellent cuisine, the mild climate and meetings with the hospitable people make Sicily a worthwhile destination. With the fixed booking you will get tips for everyday life and detailed documents for excursions and hikes. Other objects: My relatives and friends are looking forward to welcoming you as a holiday guest. Make your selection from a range of private, small or large holiday properties in S. Giorgio. See under vacation homes no. 22520, 23612, 504613, 27127 and 522241. All accommodations are maintained by the owners and are worth the price. I am happy to be at your disposal for further information and photos. Also under my homepage www. SICILY-me. You can find photo photos of holiday objects. Familie Bongiovanni sind richtig nette super Vermieter!!! Das Haus liegt super somit hat man ein schönen Blick zum Meer und es ist auch nicht weit dorthin zum Strand mit dem Auto!!! Das Haus ist schön geräumig und gemütlich!! Jedes mal gerne wieder wenn wir in Sizilien sind!!! Danke für den super Aufenthalt!!! Wir möchten uns auf diesem Weg nochmal ganz herzlich bei Familie Bongiovanni bedanken. Das Haus und die Gegend sind wunderschön. Wir haben unseren Aufenthalt sehr genossen. Uns erwartete hier ein wunderschönes, perfekt ausgestattetes und sauberes, sehr gepflegtes Ferienhaus mit viel Platz. Auf der großzügigen Terrasse frühstückten wir jeden Morgen mit Blick auf das Meer. Von hier aus lässt sich auch wunderbar der Sonnenaufgang über dem Meer anschauen. Familie Bongiovanni ist sehr herzlich und immer da, wenn man sie mal brauchen sollte. Wir kommen bestimmt wieder! Die Lage, die Ausstattung und der Komfort der Unterkunft war überragend. Super Blick aufs Meer und sehr freundliche und angenehme Vermieter. Klasse ! Ein sehr schönes, gepflegtes und gut ausgestattetes Haus in ruhiger Lage mit fantastischem Blick aufs Meer und die Liparischen Inseln. Die Wegbeschreibung war sehr exakt, wir hatten keine Probleme, das Haus zu finden. Die Gastgeber waren sehr nett und es war sehr hilfreich, deutsch sprechen zu können. Die Lage war gut für Ausflüge in die Berge ebenso wie zum Ätna oder nach Cefalù. Wir bekamen Restaurant-Empfehlungen, davon hat uns das "Il Panorama" in Librizzi am besten gefallen. Insgesamt haben wir uns rundherum wohlgefühlt. Das Haus ist genauso wie in der Beschreibung angegeben. Alles ist sehr gepflegt, gemütlich und sauber. Die Vermieter sind sehr nette Leute, denen es wichtig ist, dass man sich wohl fühlt. Und wir haben uns total wohl gefühlt . vielen Dank dafür. Für uns war aber traumhafte Blick auf das Meer und die liparischen Inseln das Beste. S. Giorgio belongs to the lovely town of Gioiosa Marea. The village itself is nestled in a beautiful landscape. In the east the Tindari is the Sanctuary of the Black Madonna and the ancient theater, in the West the rocky Capo Calavà where the sunset is an experience. The highway leads in the mountain pass (tunnel). Before place a diversified sand-gravel beach is spreading with shallow and rocky sections. The fishermen sell their fresh catch on the beach. Shops for daily needs and various restaurants available in the village. In Patti Case Nuove is every Saturday morning market. In the land around S. Giorgio are some Agri-Turismo (Landgasthaeuser own products) at exclusive locations. This offer delicious, local food at reasonable prices. The nearby Nebrodi mountains to the west and the Peloritani mountains to the east are walking paradises. The mild climate, the rich cultural and natural diversity and the proverbial hospitality make Sicily holiday an unforgettable experience. Die Preise sind inklusive Endreinigung, Bett-, Kuechen- und Duschtuecher sowie Gas. Strom und Heizung werden nach Verbrauch verrechnet.